Small Engines is designed to help you learn about small engines and other power equipment, especially equipment used around the home. Youth will learn how gasoline engines operate, acquire skills needed to operate engines and equipment safely, and become familiar with safety rules before starting and while operating engines. This project creates a desire for members to develop safe starting procedures and promote safe practices at home. 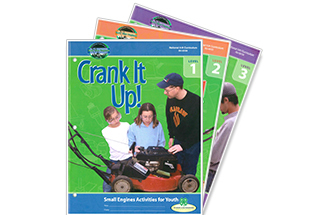 Click the Image above to purchase Small Engines project books!